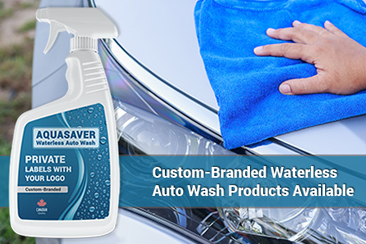 The AQUASAVER Spray-On Waterless Auto Wash is a fast, easy-to-use and completely eco-friendly car care product. 100% biodegradable, the spray-on formula can remove light grease, dirt and road grime without water. You simply spray on, wipe off, dry and shine! Whether you’re indoor or outdoor, in just 15 minutes, you’ll have a high-quality, non-streak finish that leaves your vehicle sparkling as new. AQUASAVER’s formula breaks down surface soils making it easy to wipe them away without rinsing. Simply spray onto the selected panel. Gently wipe with your first microfiber towel. Polish with the second microfiber towel. That’s it! With over 300 million passenger vehicles in North America, car-washing activity creates a major problem for our waterways and aquatic life. At Velocity Chemicals, we are committed to developing eco-friendly car wash products that help to conserve water and prevent pollution. AQUASAVER leaves a long-lasting thin protective film that repels dirt, keeping vehicles cleaner for longer. AQUASAVER’s revolutionary technology wets and lifts grime from surfaces making it easy to wipe away with no risk of scratching. One-step easy application — No hoses! No rinsing! No drying! Conserves up to 500 L of water per wash, making it better for the environment. Works on paint, clear coats, glass, metal, and plastics, leaving a streak-free finish. re-formulated and re-packaged with your own brand. Conserve water. Prevent water pollution. 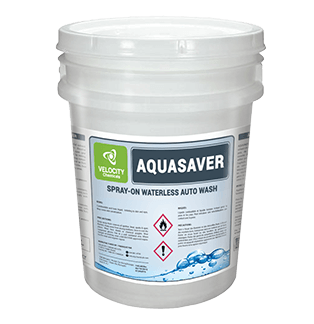 Switch to AQUASAVER Spray-On Waterless Auto Wash from Velocity Chemicals, the industry leader in high-quality car care products for over a decade. To order, call one of our specialists today at 604 881 4700. We offer a 100% Money-back guarantee.